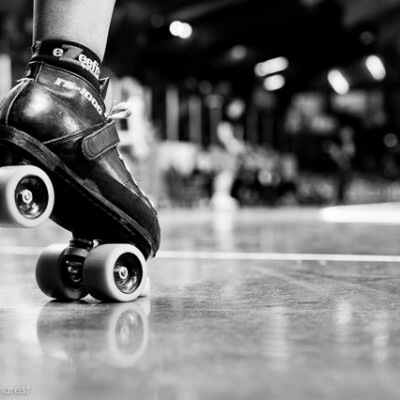 If you follow me on Facebook or get my newsletter you know that I love Weight Plates and Rollerskates, an excellent fitness blog written by Lilith NoFair of “the other” TCRG, Tri-Cities Rollergirls from Ontario, Canada. Lilith (aka certified Personal Trainer Laura Wombwell) runs How We Roll Fitness, bringing a trainer’s background to derby athleticism. She’s here for a two-part series on getting what she calls the Big Rocks in your training. Fasten your seatbelt for this mega-post, and get out a notebook, cause NoFair’s got a goldmine of information coming down your internet pipes! 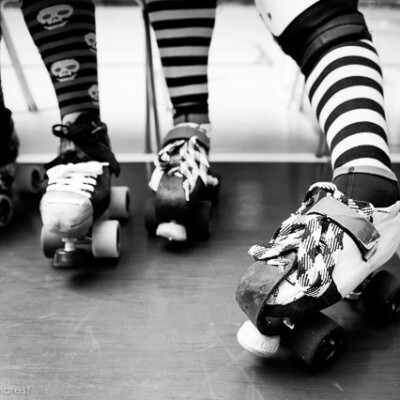 *photo courtesy of my favourite skate shop, Rollergirl.ca! Our growing interest in serious athletic training to suit the needs of our sport is awesome, but the majority of us still have to hold down a 9-5, which leaves little time to train, plan, and execute the way we need to. 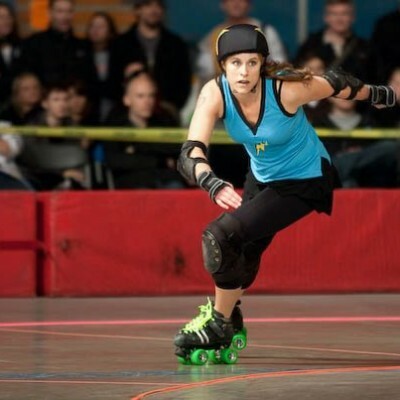 In my own life just answering my derby emails can seem like a workout, so it’s important that my time in the gym is as efficient as possible. So, when it comes to weight training, where do you even start? Alwyn Cosgrove, a pretty cool dude in the fitness industry, talks a lot about the “Big Rocks” theory – the theory being that if you fill up your jar (training time) with sand and gravel (isolative exercises like bicep curls or triceps kickbacks, or single energy system work (like running on the treadmill for hours), you fill up the jar quickly. If you put the big rocks in the jar first (compound, whole body movements), the space for smaller rocks will present itself. The key, no matter how much time you have, is structure. If you focus on the “big rocks” of training and learn to prioritize, you can get a great cross-training session in no matter how crazy your schedule becomes. Push – This can be a vertical push (like a military press) or a horizontal push (like a push-up or a bench press). Pull – Again, can be vertical (like a pull-up or a lat pull-down) or horizontal (like a row). Squat – This can be any one of a million variations (box, goblet, plie, 1-leg, isometric, and so on ). Pick the level of challenge and style that’s right for your goals. Hinge – A hip-dominant movement (like a glute bridge, hip thrust, deadlift, or kettlebell swing). Single Leg – Can be stationary or moving (try step-ups, 1-Leg RDLs, lunges of various directions, split squats, rear foot elevated squats). 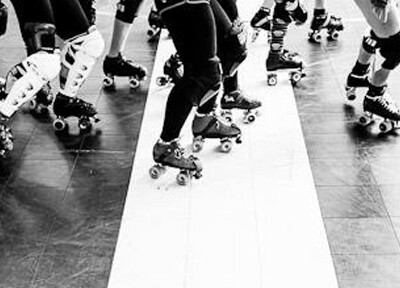 Gait – Something that gets you moving, with an element of challenge (heavy carries, sled pushes or drags). But NoFair, what about my killer Abz? When do I get to train those? Couple of options – you can have a dedicated “core circuit”, though if you’re low on time all of those compound movements we talked about will target your core at the same time as your other large muscle groups. If you want that core workout, here are some ideas that are better than crunches: planks, side planks, pallof presses, stability ball rollouts, leg lowers, birddogs, half kneeling chops and lifts, bodysaws – basically anything that gets you to resist flexion, extension, or rotation in your trunk. Booty here again – as if that insight wasn’t already enough, in Part 2 of this post, Lilith NoFair tells you exactly how to plan a Big Rocks training session, and how to prioritize your training time overall. In the meantime, examine your own routine. Are you hitting the Big Rocks? Are you finding a mix of the 7 essential movements? See what you can add (and remove!) from your routine to make you stronger, more efficient, and ready to add weight to your program.